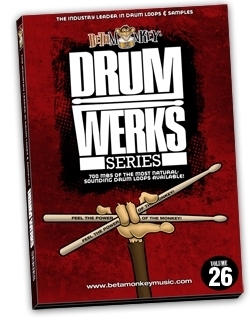 “Drum Werks XXVI Rock Ballads” features 700 “soft rock” drum loops, which is to say, they are a bit more chill in terms of tempo and attitude than our usual rock sample packs! Yes, we’re aiming this loop pack at all you out there looking to write love songs and ballads in the vein of Bryan Adams, REO Speedwagon, Bon Jovi, and Guns n Roses. Hell, even Led Zeppelin didn’t go full throttle on every song. Sometimes you have to slow things down and let the groove breathe. And, when that time comes, you need to reach for two things: your guitar and Drum Werks XXVI: Rock Ballads. Let your feelings flow and get inside the rhythmic space of these rock ballad drum loops, perfect for any ballad or slow rock songwriting. But, don’t get us wrong, these aren’t lifeless, stiff, uninspiring “beats” you usually find from imitators – these are 100% live acoustic drums played by one of L.A.’s top on-call session players. Drum Werks XXVI will take the tempo down, but give your songwriting a potent toolbox of drum tracks to write music that evokes the emotional side of ballad songwriting but with powerful and unmistakably live rock drum sound. Rock or country ballads, singer-songwriter acoustic rock and pop, laid-back country, there’s a wide range of musical application for the rock ballad drum loops found on Drum Werks XXVI. With a versatile collection of grooves ranging from 40 bpm to 100 bpm, Drum Werks XXVI: Rock Ballads will lay the foundation of your most sensitive and emotional compositions for today’s working songwriters and producers. If you’re inspired by The Eagles, Pink Floyd, Kansas, Aerosmith, Allman Brothers, Eric Clapton or any other artist who has lived on the “softer” side of rock, then these loops will serve you and your music well. And, for even greater songwriting flexibility, we’ve included a complete matching multi-velocity drum and cymbal sample set. These are the actual samples of all the drums and cymbals used to record the drum tracks. Not just a handful of samples, we’re talking an extensive and complete set of samples, enough to develop your own drum virtual instrument and sequence new drum parts. This gives the loop collection unlimited flexibility and potential. Powerful sounds, powerful grooves. Drum Werks XXVI: Rock Ballads will inspire your passion for ballad and soft rock with a versatile collection of live, acoustic drum loops. Full Range of Rock Ballad Drum Styles: Whether you need spacious ballad or rock drum tracks, put these live studio drum loops to inspired use. Grooves sets ranging from 40 BPM to 100 BPM will deliver authentic live ballad and soft rock drums. 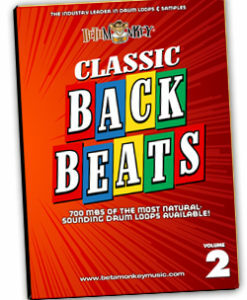 Cohesive Drum Sounds: All Drum Werks XXVI rock ballad drum loops are from same recording session. Superior Rhythmic Realism: No stiff metronomic beat detective corrected drumming here here. Live, studio grooves show you what a experienced session drummer can do – rolls, stick drags, dynamics not possible on anything but a real kit with a real player. Fully-Sampled Drum and Cymbal Samples: Build even more great grooves with a complete multi-velocity sample collection of all the drums and cymbals recorded on Drum Werks XXVI. High-End Production: With gold and platinum experience behind the kit and console, Drum Werks XXVI delivers the quality your music deserves. Multi-Collection Compatibility: This collection is part of our “L.A. Three” Sessions. Mix and match with any other collection from this studio session: Drum Werks XXVII, Drum Werks XXVIII, Odd Time Meltdown III. 334 (715 GB 24-bit WAV and Apple Loops; 477 MB 16-bit WAV) original, license-free drum loops, samples in 16-bit, 24-bit WAV, APPLE LOOPS formats. DVD Format – ALL ACIDized WAV, APPLE, and REX2 (if available) formats included for download and/or for hard copy DVD purchases. After trying loops from other sellers, I discovered you guys. I have to say, I am very impressed and will be back for more! As a fan of Pink Floyd, I really wanted drum loops that would help me hit that smooth clean sound that Floyd has on The Wall and Dark Side of the Moon. The loops in this set do just that. Sometimes drum loops can be too complicated sounding. But these give a solid foundation for that slow rock round. The loops are named by the drums/cymbals that are used in them. So you see HH, RC, and Cr a lot, as opposed to Verse, Chorus, or Bridge. If there was one thing that I found a little lacking, it was that a number of the fills were on the complicated side. I feel like many of the fills didn’t really fit well with my slow rock songs because they were too fast or had complicated twisting rolls on the toms. If there were more slow fills that could be used to connect various parts of the song together, I would definitely give five stars. With that said, I do recommend this set of loops and would purchase it again myself.